Staying calm cool and collected in the face of life's "OH @#%#$ moments"
We have all found ourselves smack in the middle of a great big "Oh @#%#$" moment, at one time or another. Those times when we come face to face with challenges and obstacles that threaten to derail our efforts, thwart our best laid plans and start us down the path of fear and doubt. Often when faced with these miserable moments, our own emotional reaction, racing thoughts, and fears of impending doom can cause us more pain and turmoil than the actual problem or threat ever could. To add insult to injury, we all know that in those moments when we are operating from fear and concern, it becomes difficult to think strait, seek out options and find effective solutions. Suddenly, all we can see is the problem looming large and all we can think about is how bad things might get. The capacity to stay calm, cool, and collected in the face of life's challenges is vital when seeking the best possible outcome; but how do you get rid of the fear and concern and replace it with clarity? I would like to explore this question further by telling you the story of the Minnesota ducks. There is a family of ducks in northern Minnesota. Every morning the ducks take a walk from their nest, across a quiet dirt road down to the pond where they spend their day. One morning the ducks were on their way down to the pond, and as they were crossing the road, along came a fast red car zipping down the pavement. When the driver saw the ducks he jammed on the breaks just in time to miss the little row of ducks. The driver became very annoyed and frustrated as he was waiting for the ducks to pass. The color began to rise in his face, his hands clenched around the steering wheel and he began revving the engine at the ducks. Finally, when the last little baby duck's tail feathers passed the front tire of the car, the driver jammed his foot on the gas and sped down the road, furious with how terribly his day had begun. He continued to have a morning of cutting people off, cursing out fellow drivers and generally being foul (pardon the pun) to everyone around him. 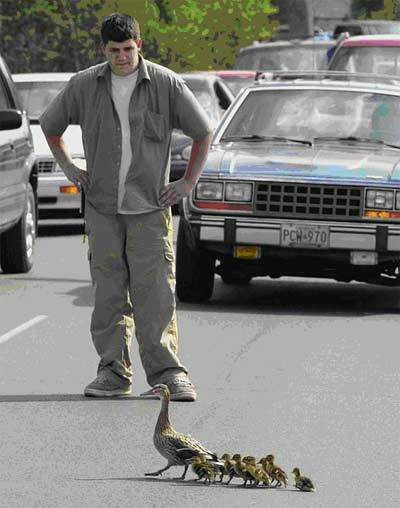 And with good reason… you would be upset too if your day started with these annoying inconsiderate, bad ducks crossing your path! The next day the ducks were off on their journey down to the pond when along came another car. This car stopped for the ducks to pass and the driver inside jumped on his phone to call a friend, "You are never going to believe what I'm doing!" he exclaimed "I'm driving to work and this whole family of ducks just started walking right in front of me. It is amazing!" He then proceeded to turn off the car and get out, and he followed the ducks as they continued down to the pond. He found a spot and watched as the ducks played and swam. After a while he got back into his car and went on tell people what a delight he witnessed that morning, and he told the story of these amazing ducks and how it was the perfect way to start the day. Were the ducks 'Good Ducks'? Were the Ducks 'Bad Ducks'? or were the ducks 'just ducks'? When I ask this question the responses are numerous, varied and entertaining, but at the end of the day there is usually a consensus reached. Whether the ducks are "good ducks" or "bad ducks" depends on the person who is witnessing the ducks. The ducks themselves are 'just ducks'. It is a matter of the individual and their perspective that determines whether the ducks are good or bad. The ducks did what ducks do and it was the people around the ducks who reacted to the ducks one way or another. The story of the ducks brings us to a very important realization about how our world works - so much is open for interpretation! Have you ever noticed how a situation that at the time, felt like the worst thing that could ever happen to you, (such as the loss of a job, an ended romance or a life threatening illness) is at a later time something you look back on and are grateful for, or even, in retrospect, say it was the "best thing that ever happened to you"? When we have these moments of hindsight it leads us to ponder, was that situation REALLY a "good thing", or was it REALLY a "bad thing", or was it REALLY a" bad thing disguised as a good thing"???? Loss of a job = tragic Loss of job = opportunity to start own business. Got dumped = tragic Getting dumped = out with the old because a better match was on the way. Life threatening illness = tragic Life threatening illness = caused you to take better care of yourself and motivated you to live every moment fully. With this in mind, we might be confronted with the million dollar question, "What IS good and what IS bad?" What is a "true problem" and what is really a "problem disguised as an opportunity"? This paradox leads to a concept we call "Subjective Reality." When two different people witness the same situation but have totally different views on it, (as in the story of the ducks) this is an example of subjective reality. Is it not the thing that is happening, the circumstance or the situation, that determines it's "goodness" or "badness", it is your perspective and how you deal with it, which gives the situation its value and meaning. What's Ducks Got to Do with it? and your husband is "just your husband"? What if that deadline is "just a point in time by which you agreed to do something,"
and that thing you did, that right now you wish you had done differently, is "just a thing that you did"? What if your thighs are "just your thighs" and your life as it is, is "just your life as it is"? Stay with me here. When I say "just" I am not saying that it is insignificant or unimportant, only that it is neutral, that it is not good or bad but that like the ducks, it "just is". Now, this is not to say that a deadline is "just a deadline" and so if I miss it, it does not matter. Depending on what your agreement is around the deadline there will be consequences but, what if the consequences were "just the consequences"? The point of this line of thinking is to bring calm and perspective to the situation, and give you space in the moment to step back from your upset and find the best possible way to act, think and be in the face of it. So imagine, if your job is "just your job", or the hole in the new sofa is "just a hole", what would be available to you? If that seemingly impossible hurdle was "just a set of circumstances to go through or around," What new action would be available to you? Seeing your life, as full of "just ducks" is no small task and yet, this is a key element to being able to stand calmly, with grace and ease in the face of whatever comes your way. What would I do different if it was "just a duck?" Take on the practice of noticing what you are labeling "Good" and "Bad". Just watch and make note of how you are interpreting the ducks in your life and whether that interpretation is serving your desired result or not. When you notice a "bad duck" popping up just ask yourself, "What would I do with this was "just a duck" and it is my interpretation of it that is making it a bad duck?" Check it out, and if you really want to have fun try out "my mother in law is JUST my mother in law"
Remember, we live in a world where it is not our circumstances but how we react to those circumstances which are the ultimate determinant of whether our story ends in triumph or tragedy. The next time you are faced with a difficult situation and you notice your blood pressure on the rise. Stop, breath and take a moment to notice the ducks. As a Professional Certified Coach, writer and inspirational speaker, Coach Joelle has supported thousands of people over the last 7 years to bring their personal and business dreams into reality.